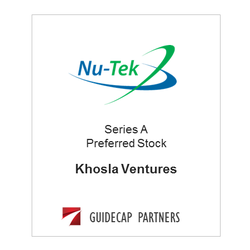 Nu-Tek Salt LLC, the creator of a patented sodium reduction solution, has received an equity investment from Khosla Ventures. Nu-Tek’s potassium chloride technology provides food processors a cost effective low-sodium alternative that maintains the taste, flavor and functionality of processed foods. The investment will allow Nu-Tek to expand capacity and take advantage of the growing sodium-reduction market. ​GuideCap Partners acted as advisor to Nu-Tek Salt in the transaction.